This joyously wacky four-person show has endured cast changes, runs in three different Broadway theaters and a recession, outlasting pretty much every other straight play without the benefit of elaborate sets or well-known stars. It's wittiness, ingenuity and old fashion theatre magic is a true testament to it's staying power! 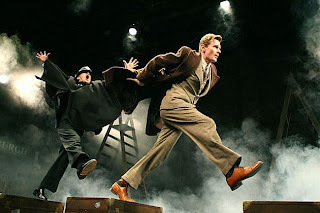 I saw The 39 Steps in Boston during its pre-New York run and then on Broadway last month and loved it both times. It's so clever and witty and inventive and so theatrical. It's amazing what can be done with four actors and a few props and some sound effects. I loved it!